Q: There are many workers but there are great disparities between workers in work capability and efficiency. How can we go about managing those differences? A: We frequently see skills tables (Toyota calls them "Tournament Records Charts") on plant bulletin boards. 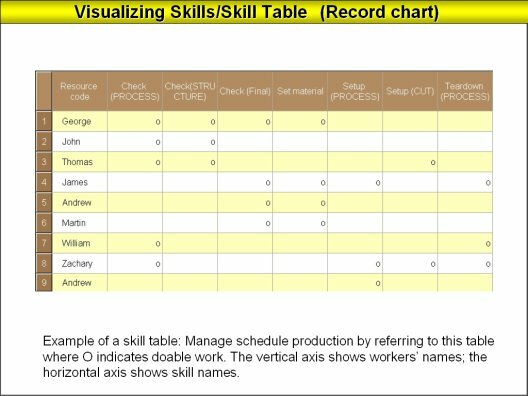 On the left side is the name of the worker, at the top is the work category and within the table are markers indicating whether or not the job could be done. Management becomes a lot simpler by organizing the data in a matrix like this. 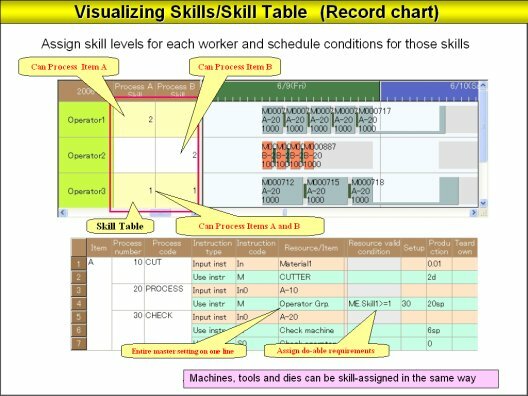 This data from a skill table can be immediately reflected, without modification, into a production schedule. That simplifies skill management and BOM assignment.